One of the all too few cases in which descendants of those who cleared the forest still, remain on the old Homestead, is found on lot thirty-one on the third of Uxbridge. There J. W. Widdifield, M.P.P., represents the fifth generation on land granted by the Crown in 1806. Even here, however, possession has not descended along the male line, the first owner of the place having been Charles Chapman, the great-great-grandfather of Mr. Widdifield on the maternal side. Charles Chapman left Bucks County, Pennsylvania, in the first decade of the last century. He traversed the comparative wilderness of Western Pennsylvania and New York, crossed the Niagara River, and, following the Hamilton-Queenston highway, Dundas Road, and Yonge Street, finally passed over the old "Uxbridge 'T'rail," to lay the foundation of a new home near the banks of a stream in the midst of the forest primeval then covering Uxbridge township. Mr. Chapman was a member of one of the many families of Quakers who came from the New England States to what was then Upper Canada and whose descendants are found in Whitchurch, Uxbridge, Markham, Pickering, and neighbouring townships to-day. These families included the Lundys, James, Kesters, Goulds, Doans, Wilsons, Haines, and Widdifields. The Widdifields came from New Jersey, but the majority of the others were from Pennsylvania. Mr. J. W. Widdifield, descended from the Chapmans on one side and the Widdifields on the other, holds as the most prized among his collection of relics of the early days the original deed granted to his great-great-grandfather Chapman. And a quaint document it is, the wax seal. being almost as large as a saucer; and the document itself, written on parchment, is as legible as the day on which it was signed by Alexander Grant, President and Administrator of the Government of Upper Canada, and Peter Russell. '1'lle original deed was for two hundred acres, and in addition to the land, it covered, "all woods and waters thereon," and "all mines of gold and silver." But there were two notable reservations. All the white pine then growing on the place, and all of the same timber that might thereafter grow thereon, was reserved for King George III. and his descendants. The other reservation provided that in case the land was disposed of by sale, will, or otherwise, the new owner must within twelve months thereafter take the required "oath or affirmation of allegiance, etc.," otherwise the grant was to be null and void and the property was to be vested in the Crown as if never granted. The first of these reservations at least has a peculiar interest for Mr. T. B. Frankisli, of Toronto, an uncle of the Mr. Widdifield of to-day, and owner of half the original two hundred acres, because he is one of the few men in Ontario who has done real forestry work on his owns farm. Air. Frankish has planted some thousands of pine trees on his holding. Many of these young pines are Scotch and therefore exempt from claim by the Crown. But many are of the white variety and thus come within time reservation noted. Air. Frankish has, therefore, performed a very special service for the King as well as his country by his planting activities. There is, apparently, no record in the deed of any monetary payment to the Crown for the land allotted, but the deed did require the erection thereon of "a good and sufficient, dwelling" and residence for the space of at least one year. There is on the Widdifield homestead another memorial, of the early days. This is part of the old "Uxbridge Trail "that once wound across lots from where the town of Uxbridge now stands to Yonge Street—the weary road that early settlers followed with ox-teams on their way to and from market in Toronto. This trail to-day- forms part of a lane leading from the Widdifield residence to a pond that, up to a few years ago, furnished a reservoir of power for one of the pioneer saw-mills of the district. There is an interesting story connected with this old mill. "At one time," said Mr. Widdifield, "there were thirteen cottages surrounding the mill site and the occupants of these cottages worked in three eight-hour shifts in the mill, that ran day and night for six days in the week. Most of the cottagers owned their homes, but as the mill business fell off the cottagers disappeared and the property reverted back into the hands of the family." To-day, not a cottage is left on the site. Some collapsed and disappeared; others were removed elsewhere to serve for other purposes; and of the mill itself all that remains is part of the roof lying prone on the land, and part of the dam at the mill site. At the other end of the darn there can still be seen part of the log bridge that formed a crossing-place on the Uxbridge trail. The pond itself is still twenty feet deep in places, but the creek flowing from it is little more than a reminder of what it once was. ''During my father's lifetime," said Mr. Widdifield, "the creek dwindled to one-third the volume it had when my father first knew it." The stream and pond are on the Frankish side of the two hundred acres and Mr. Frankish has turned these into a fishing preserve. Among the other memorials of the early days in Mr. Widdifield's possession is the minute and account book of the first school in the neighbourhood." The school building was erected just across the way from the Widdifield home. This school was built in the fall of 1853, and the box stove used in it cost four pounds Halifax currency. Three elbows cost. fifteen shillings and three-pence; and fifteen length of pipe, ten-pence each. One hundred and twenty cut nails were bought at one pound and five shillings. The first teacher, Rachel James, holder of a third-class certificate, was engaged at the magnificent salary of two pounds, twelve shillings and six-pence per month for six months, the salary to be paid at the expiration of each month. But the high cost of living soon began to make itself felt even in those days; and Maria Bently, the second teacher, was paid two pounds and fifteen shillings for the first three months, three pounds for the next three months, and three pounds and five shillings for the last six months. In 1854 Sarah Jayne Blanding was taken on at nineteen pounds and ten shillings for half a year. At the beginning, the funds for the payment of the salaries of the teachers were raised by public grant, by general assessment on the section, and by fees paid by each pupil. In the first year of the school's history, the largest sum in fees was paid by Mr. Sherman—seven shillings and six-pence; and the lowest by Mr. Simerson —two shillings and six-pence. In the second year of the school's history, James Allcock moved that the fee per pupil be one shilling and three-pence for the year, Albert Bently moving an amendment that it be one shilling and threepence per quarter. A. compromise was affected on motion of Simon Allcock making the fee two shillings and six-pence per year. On November 25th, 1854, it was proposed to split the section and hold school in each half for six months "to give children in more remote parts of the section a chance." Another motion considered was to exempt from fees children who lived over two and a half miles from the school. As the settlement progressed, more liberal ideas in regard to education began to make way; and, in 1885, Albert Bentley moved that fees be abolished and the school made free. This motion was lost, but a like motion by Mr. Bentley a year later was carried, and education has been free ever since. But if that old mill and the still older Uxbridge trail could only speak, what stories they could tell of the majestic pines in which the night winds sang their lullabies, of the musical hum of the saws making lumber for the settlers' dwellings, and of the heavy climbs by weary oxen over steep hills on the winding road leading to Yonge Street and Muddy York beyond. Here is another case of a farm being in possession of the same family continuously since the early days of Ontario, and in the male line at that, the present owner being the Honourable Manning Doherty, Minister of Agriculture for the province. A peculiar circumstance, shoving how much there is in luck after all, was connected with the choice of location made by Bernard Doherty, the great-grandfather of the minister of to-day. When the first of the family arrived at Muddy York in 1812, he was offered a "farm" on the land now bounded by Queen, Yonge, University Avenue, and College Street, in the City of Toronto. But this location, now in the very heart of a city of over half a million people, was scornfully rejected as being too low and wet to be suitable for agricultural purposes. 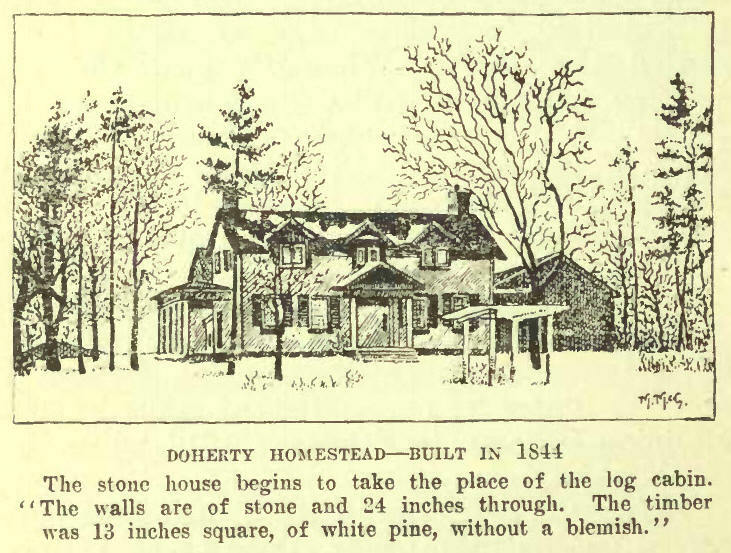 Instead of accepting this property Mr. Doherty went out to the vicinity of what is now Dixie, in the County of Peel, where five hundred acres were taken up. Three hundred of the total are owned and operated by the great-grandson of the original owner. For nine years over the even century the title deeds of that property have continuously carried the Doherty name. Although the first of the Dohertys arrived in Canada in 1812, permanent location was not made until three years later. The necessity of returning to Ireland to wind up affairs there caused the delay. When Bernard Doherty reached Quebec in 1815, he learned of the Battle of Waterloo and of the final collapse of the power of Napoleon—an incident that provides a graphic mental picture of the time that has elapsed since the Doherty homestead at Dixie was established. An interesting light was thrown on the conditions that existed a little over a century ago in the metropolitan district of which Toronto is now the centre by one statement made by Mr. Manning Doherty, in February, 1916, when discussing early days. "After the first crop of wheat had been harvested on the place," Mr. Doherty said, "my great-grandfather took a couple of bags on horseback to be ground at the old mill on the Humber. There was no paved highway to Toronto in those days, and the journey was made over a blazed trail through the original forest. For many years after that all the grain crops were cut with a sickle, and when in the time of my grandfather the first cradle was introduced, it was thought that the last word had been pronounced in labour-saving implements." 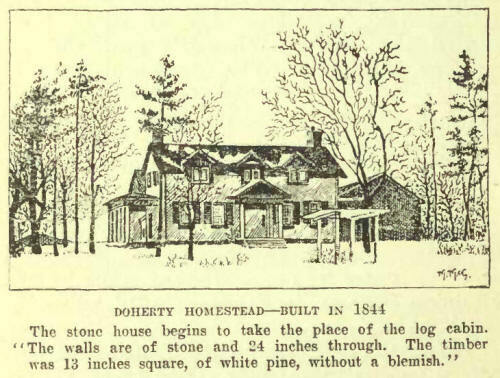 "The first house on the place," Mr. Doherty went on, as he continued the story of the early clays, "was of logs and was still standing when the rebellion of 1837 occurred. There was a huge hearthstone in front of the open fire-place, and this was taken up and a hole dug beneath in which all the money in the house, put into a covered pail, was buried until the trouble was over. Nor was this precaution without. reason. When William Lyon Mackenzie was fleeing from Toronto to the border after the collapse of his forces, my grandfather drove him from Willeock's Farm at Dixie on Dundas Street, as far west as the Sixteen Mile Creek. Had this been generally known at the time it might have had serious consequences for my grandfather. A new house was built in 1844, the wads being of stone and twenty-four inches through. A few years ago, when some improvements were being made, an old sill was removed. The timber was thirteen inches square, of white pine, without a blemish; and, although it had been in place for three-quarters of a century, the wood was still as sound as when cut from the surrounding forest.."
Of corresponding interest is the story of the Morrisons, who came from the county of Longford in Ireland to what was then the wilderness of the township of Peel in the county of Wellington. Three months with no stops by the way was the experience of Robert Morrison, father of J. J. Morrison, the moving spirit of the U.F.O. movement to-day. The weary pilgrimage of the first Morrison began, in 1845, with a tramp from the ancestral home in Longford to Dublin, this being followed by a tempestuous voyage in a small sailing craft to Liverpool. Between Liverpool and Quebec six weeks were spent, and then the real hardships of the journey began. From Montreal to Kingston by way of what is now Ottawa, the only means of travel available at that time were open boats, drawn by horses walking on the bank when the rapids were reached; boats in which people sat huddled in discomfort during the day, and that were aliuost. unbearable when sleep and rest were sought with the coming of night. Nor did relief come even when the long water journey ended at Hamilton. Rather was it merely a change from one form of hardship to another. From Hamilton to Guelph, passage was taken by stage which followed the circuitous route through 0-alt and Preston, over roads on which the jolting of the rude vehicle jarred and rocked muscles cramped and stiffened by the narrow quarters of the old Durham boats on the St. Lawrence. The pilgrimage ended, as it began, on foot. From Guelph, then a mere hamlet, it was a case of tramping over mud or corduroy roads, and finally a mere trail, to the location selected on lot eighteen, concession thirteen of Peel. "We of the present," said Mr. J. J. Morrison in telling the story, "can form but the faintest conception of all that was involved of physical suffering and mental anguish in the coming to this country of those who arrived here from the British Isles in the 'thirties, 'forties' and 'fifties of the last century. All the associations of home and childhood were forever left behind. The conditions endured in crowded and unsanitary sailing vessels, and the perils faced, were such as those who travel by the palatial ocean liners of to-day cannot possibly visualize. The experiences after arrival were even more trying than those borne during the weary journey across the sea and by inland waterways. 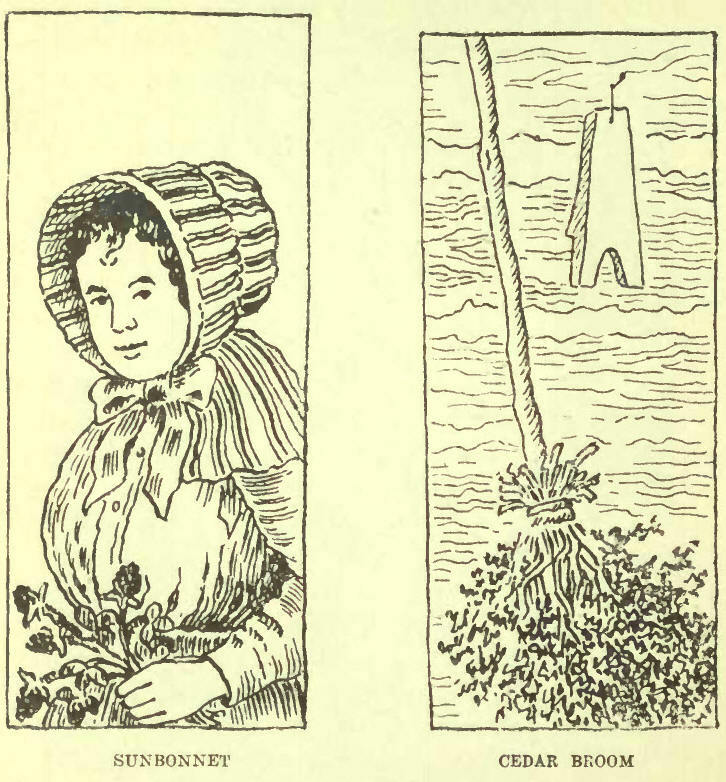 The neighbours in the new land, where there were any, were all strange; skill in the use of the tools required in building homes, clearing the forest, and cultivating the newly cleared fields had to be gained slowly and painfully by experience. Stalwart of frame, firm of purpose, and possessed of patience inexhaustible, these pioneers must have been, otherwise they would either have fallen by the wayside during the migration or have perished amid the loneliness of the forest after their arrival." Of all the counties over which I passed awheel in the last year of the old century, I do not recall one which presented a more interesting field of study, where the virtues of hospitality and good neighbourhood were more manifest, or where there was better evidence of a quiet, but genuinely religious sentiment pervading the community, than Haldimand. The county was interesting as a demonstration of the work that is going on more or less all over Canada in the building of a new nation out of varied elements. Nowhere else, in rural Ontario at least, have people of so many different races been thrown together within so narrow a circle. In Rainham, for example, the northern half of the township was at the time of my visit practically solidly German, while English and Pennsylvania Dutch divided the remainder of the township fairly evenly between them, with a slight scattering all over of "Canadians" and Irish. The neighbouring township of Walpole was fairly solidly English, but in all parts of the county the three chief elements named were more or less mixed. At the beginning, the different races were divided in language and in sentiment. The Pennsylvania immigrants of the first generation spoke Dutch, those from Germany conversed in German, and those from the British Isles in English. To the first, "Home" or "the Old Country" meant Pennsylvania; to the second, the words spelled Germany; to the third, they carried memories of the hedgerows and ivy-clad towers of rural England. But a change had come as far back as twenty years ago. Even in that part of Rainham then known as "Little Germany," English was becoming the language of the people. "Although," said Nicholas Reicheld, one of the first settlers in the section, "English is taught only half a day at school, it is in English that the children converse when going to and from school." All over the county, while among the older people German or Dutch could still be beard at that time, English was practically the universal tongue among those of the third generation; and a common tongue was creating a common Canadian citizenship. Mr. Reicheld was born in Lorraine in 1833, thirty-seven years before that province was lost to France as a result of the war of 1870. Although a German, as his name indicates, and also Protestant, Mr. Reicheld preferred French to German rule. "True, French was the official language," he said, "but in the home we spoke in whatever tongue we liked and there was less of police rule and less of irksome taxation under France t hau there was afterwards under Germany. After the province passed under German control in 1870, there was a considerable German migration therefrom, some of these emigrants going to the township of 1:Iay, in Ontario. The German emigration to Lincoln, Welland, Haldimand and Waterloo began in the 'thirties of the past century, about the same time that the emigration from the British Isles assumed considerable volume. At the commencement this German emigration was purely the result of chance. One or two came and found this a goodly land, and others followed. F. L. Beck, and his brother, for instance, came over because of what they had heard from friends in Lincoln. The first of the Schneiders, on returning to Germany after having been in Haldimand, told the young men lie met that in the three years they expected to spend in the German army, they could earn the price of a farm in Canada. Schneider narrowly escaped a German jail for saying this, but as a result of his statement Nicholas Schneider and half a hundred others from the old home came to Canada in the 'thirties. The collapse of the democratic uprising in Europe, which occurred in 1848, gave a still further impetus to the movement. These emigrants from the Continent, like those from the British Isles, came here hoping to find a land in which they might escape the grinding burdens due to old wars, and the danger of new wars, and where each might hope to enjoy in peace the fruit of his own toil. "At frequent intervals during the year," Mr. -Beck stated, "a constable went through our village ringing the bell to remind the people that a tax of some kind was about due." The burden of taxation and the general social and political conditions under the non-democratic governments of the time, were among the impelling motives that drove people across the seas. Those from the Continent came under a greater handicap than immigrants from the British Isles. Everything was strange for them, even the language of the new country. "When we landed at New York, sixty-five days out from Bremen, we hardly knew a word of English," F. L. Beck told me, and without a trace of foreign accent in the telling. "But I started in to learn as soon as I cane. I asked the name of this article and that in English until I learned to speak it myself. I learned to read English from the New Testament." The first steady job Mr. Beck obtained after arrival was when he hired out on a farm at sixty dollars a year. In one winter, shortly after coming, he and his brother took contracts to thresh grain with a flail, their rate of pay being every ninth bushel when they boarded themselves and every tenth when they were supplied with board. Eventually Mr. Beck settled down on lot fourteen on the sixth of South Cayuga. "There were plenty of wild animals there then," said Mr. Beck. "Once, when my brother-in-law, Schneider, was hunting his cattle he was attacked by wolves. He fired at one and as the charge was of light shot, this simply made the brutes more angry. Using his gun as a club, he retreated towards the clearing; but the animals were not beaten off until friends came to Schneider's assistance. I have no doubt that if one of the wolves had got hold of his clothes lie would have been dragged down and killed." Mr. Beck told of an amusing incident connected with Mackenzie's candidature for Haldimand in 1815, after his return to Canada. "Mackenzie stopped at our place once during the campaign and held a meeting in the schoolhouse on the corner of our lot," said Mr. Beck. "There was no disturbance; but at the conclusion of the address a number of questions were asked, for all of which the speaker had ready answers. Asked by a Conservative if he had not run away after the affair at Montgomery's Tavern, Mackenzie said: "I did, and if you had seen me on the back of the black mare you would have said I was making mighty good time, too." The American Civil War and the old Reciprocity Treaty combined brought great prosperity to the farmers of Haldimand. Wages were low and farm products were high. "Labour was cheap," said Mr. Beck, "because the country was full of bounty jumpers and of `skedaddlers' who had run away to escape the draft for the Northern armies. There was no trouble in getting one of these for ten dollars per month. Some ingenious methods were devised in getting these runaways across the border. One woman brought her husband over in a box, which, according to the shipping bill, contained a breeding hog. "The country was full of American buyers. I have seen these men bring over two or three shot bags filled with coin. In going back the bags were empty, but in exchange there were from fifty to four hundred sheep in a drove. Twenty dollar American gold pieces were common, and cows that had been selling around eighteen dollars jumped to forty dollars, a big price for that time." "In one respect those who settled in I3aldimand in the 'thirties were fortunate. Being near the front and near water communication the timber on their lands had at least some value. "The land cost four dollars an acre," said Mr. Schneider, "and the timber we sold paid for a good deal of this. The old people never became expert with the site, but the young men were as skilful as the best after a month in the woods. In our first winter here, four of us, from sixteen to twenty-two years of age, chopped sixteen acres. In the following summer we logged and burned eleven acres and sowed it in fall wheat." One of the greatest hardships borne by the first German settlers was in maintaining their religious services. In all sections of the province such difficulties were met with, but in the case of the little German communities they were felt with especial severity, because, to the scattered nature of settlement was added the language problem. Nowhere was more unselfish service shown in meeting a difficult situation. "Our first Evangelical minister was Mr. Ice; and his field extended all the way from Buffalo to Cayuga and from Cayuga to Delhi forty miles further on," said Mr. Beck. "Still, services were held once a fortnight, with twenty to thirty people present. For the quarterly meetings people came long distances on horseback, and these services lasted through Saturday and Sunday. One of the most powerful and convincing preachers we ever had was Mr. Schneider. He kept up his work for many years, frequently travelling forty miles to keep appointments, and for all this he never received a dollar save during three years when he gave his whole time to the church." "But," said Mr. Schneider, very simply, when I saw him later, "there were little flocks here and there without a shepherd and I thought it my duty to serve them." In the Evangelical cemetery at Fry's Corners, on the Dunnville - Port Dover Road, one may see evidence of the fact that, as eyes were closing in death, thoughts turned to the place where the light of day was first seen and the mother's love song was first heard. In this Haldimand God's Acre, where lie the Kohlers, Becks, Seliwanzers, and Schmidts, was seen one of the most remarkable instances of marital constancy I have met with anywhere. On one tombstone was recorded the fact that the wife of Peter Zimmerman had died October 9th, 1879. Above this was lettered the name of Peter himself with a blank on which to record the date of his death—a blank that was still unfilled twenty-one years later. Another evidence of the strength of the family tie among the German folk of Haldimand is seen in the practice, commonly followed, of setting a plate and chair at the family table for the father or the mother who has passed away. "When I first came here," Mr. McCallum said, "Stratford consisted of a dozen houses, two taverns and a flour-mill. Almost the entire country surrounding the future city was covered with bush; and real bush it was. On our own place there were maples four feet in diameter and rock elm, seven feet. The cutting down of these trees and burning of logs and bush did not by any means end the labour of clearing the ground. The great stumps, in many cases forty of them to the acre, still remained. I have seen three successive grain crops produced among such stumps without the aid of a plow, the seed being covered with hoes in the hands of children. In the beginning, wheat, produced under such circumstances, had to be hauled all the way to Galt to be ground. This was before a grist-mill had been built in Stratford. I have seen wheat sold in New Hamburg at sixty cents per bushel, and a third of that in trade. Frosted or rusted wheat could be disposed of only to distilleries. There were two of these on the third concession at that time, and their output sold at twenty cents a gallon. "Although timber was so abundant, the work of preparing it for building purposes was exceedingly onerous. We had to haul logs fourteen miles to Wilmot's Centre to be sawn. There were at that time three saw mills on Cedar Creek within a quarter of a mile of each other; but all trace of these, save part of one of the dams, has since disappeared. "These old-time saw-mills were very crude affairs, `up-and-down' saws being used. The logs were not cut right through to the end in sawing, a foot or so being left uncut for the `dog' to hold on by. 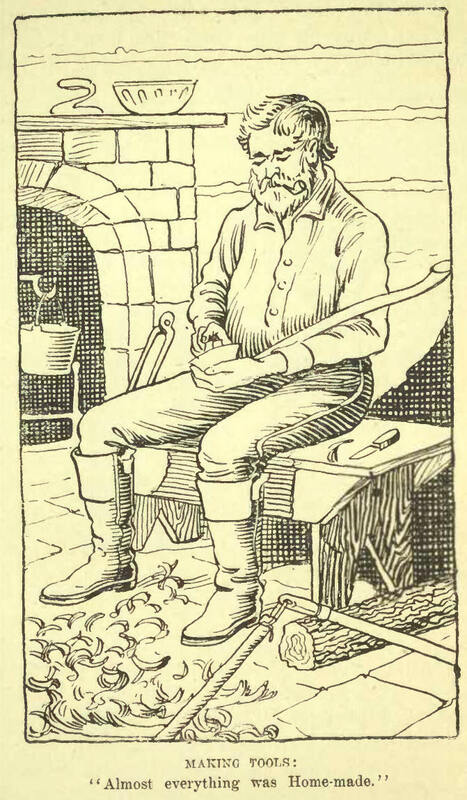 When the work of sawing a log was finished the `dog' was loosened and the uncut section at the end was finished by splitting with an axe. This split end of the boards was called the `stub-shot,' and was thrown in free of charge by the mill-owner. All the rough edging, suitable for roofing, one could pile on a sleigh could be had for a dollar. The choice lumber was choice. I have seen boards sixteen feet long and three feet wide without a blemish. "Another little cross-roads village in the neighbourhood of the saw-mills was called `Shingleton,' so named because shingles were made there. The shingles were split by hand from huge pine blocks, this work being done in winter by men who worked as carpenters in summer. "Almost everything was home-made. Wool clipped from sheep on the farm, was carded at New Hamburg, Baden, or Haysville; and German weavers, to be found in every neighbourhood, wove it into cloth. Woolen shirts, the only kind known at that time, were likewise homemade. Clothing of this kind could hardly be worn out. Leather, in those days, was real leather. Hand-made top boots, costing two dollars and a half to three dollars per pair, would outlast two or three pairs of to-day, and the tugs of our first set of harness are still in use." The first boom for settlers in South Perth came with the Crimean War, when wheat went up to two dollars and a half per bushel and dressed pork to eight dollars per hundredweight. But this "prosperity," like that experienced during the late war, was fictitious and was soon followed by a period of depression. of all the property therein. To-day Elma is one of the most prosperous townships in Ontario, dairying leaving wrought the change."